The NBL is back for the 2018-19 Season. Bellarine and Melbourne United have joined forces to provide you and your family with awesome benefits just for being a part of this club. 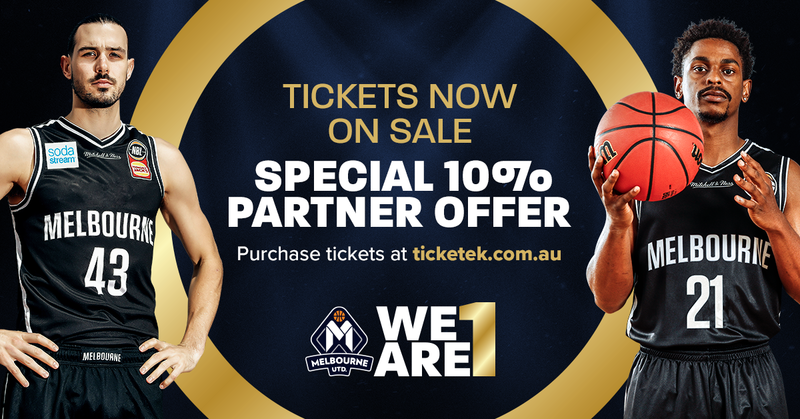 As part of our Grassroots partnership with Melbourne United, we have access to 10% off individual game tickets for players, families, coaches and staff throughout the 2018-19 season. On top of this discount if our club has the most fans attending games for the entire season, a money-can’t-buy experience will be coming our way! We could win a “Gametime by Kmart” visit from the Melbourne United players themselves! This will see our Bellarine junior representatives going head to head against one of the greatest NBL rosters ever assembled. Up-and-comer Mitch McCarron has also joined the team and they welcome back crucial pieces from the Championship winning team in David Barlow, Josh Boone and Pete Hooley. There has never been a better time to be involved with the NBL – teams are loading up as they search for Championship glory. There is Boomers galore and plenty of imports that will set the league alight. Be sure to get amongst the 2018-19 action & help us win that Gametime experience.